The Englishman’s Grave outside Merweville. It’s late afternoon some years ago and a very long drought has just broken over the village of Merweville in the Northern Cape. We’re standing at a one-man graveyard outside town, where a soldier called Walter Oliphant Arnot lies buried. 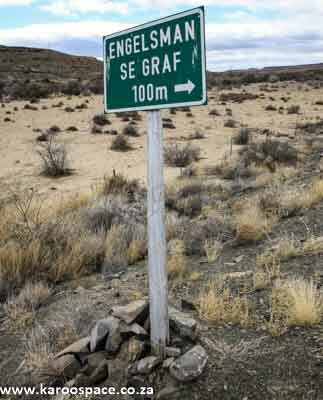 Locals know the spot as Die Engelsman se Graf (The Englishman’s Grave), but in real life Walter was an Australian, a gunnery lieutenant in the Anglo-Boer War. It is said there were money problems back home. They also say Arnot scribbled something in his prayer book about not being a Boer agent, before he went up a little hill and shot himself. It’s just a sad little story from a century ago. But what makes it a great story is that the people of Merweville assured the Arnot family back in Australia that they would tend his grave forever. And, thus far, they have. The Notables of Matjiesfontein lie in peace here outside the village. 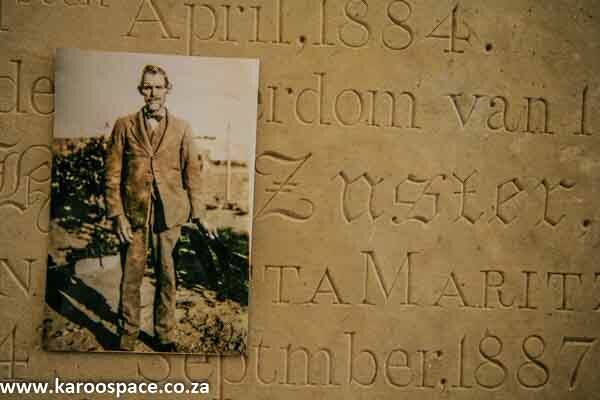 About 160km south-west on the N1 is a collection of graves where old and famous friends are buried. We’re talking about some of the notable characters of Matjiesfontein: owner Jimmy Logan, cricketer Edward Lohmann and General Andrew Wauchope, who lost his life in the battle of Magersfontein outside Kimberley. The little country cemetery stands about 10km west of Matjiesfontein village, where the bright lights of the Lord Milner Hotel shine every night, as entertainer Johnny Theunissen plays the piano and sings his lusty ditties to patrons in the Laird’s Arms pub. 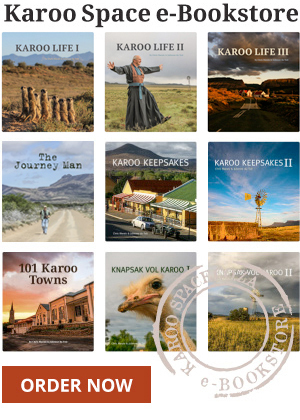 Englishmen lie buried all over the Karoo. Back on the eastern ridges of the Cederberg looking down on the arid plains of the Tankwa Karoo is another “Englishman’s Grave”, where Lieutenant Graham Vinicombe Winchester Clowes rests. Clowes of the Gordon Highlanders survived defeats at the major battles of Majuba and Magersfontein, only to be killed in a chance skirmish with a Boer patrol up here, in one of the most breath-taking geological formations South Africa has on offer. His mother came out all the way from England after hearing the news, tracked the site down and had a memorial erected. Cornelius de Waal, Tombstone Engraver of Williston. Should you descend and drive the rather daunting Die Bos road to the R355, head up to Calvinia and then across to Williston, you’ll soon be in De Waal Country. Cornelius de Waal was a tombstone scribe. For one pound a month, working on site for as long as nine months on a piece, he would cut names and dedications into sandstone. The lanky, often-impoverished De Waal’s legend lives on in the form of these hand-inscribed stones that you still find in the Williston cemetery and on scattered farms in the area. The bedstead in the veld between Aberdeen and Willowmore. Going south towards Aberdeen from Graaff-Reinet in the Eastern Cape, you’ll need sharp eyes to spot a poignant little sight on the left. It’s an ornate old cast iron bedstead that, according to legend, covers the grave of a woman who died on trek nearly 200 years ago. Apparently she succumbed to her illness before her husband could get her to a doctor in Graaff-Reinet. 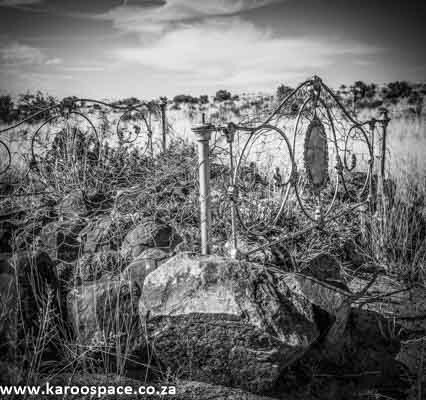 So he buried her here, placed their marital bed in the tawny veld as a headstone and moved on, leaving this as the only evidence that he or his wife had ever passed through the Karoo. 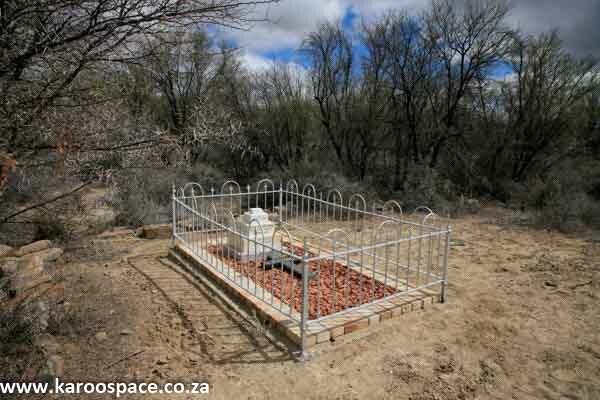 The grave of John Sweet Distin in Middelburg, Eastern Cape Karoo. 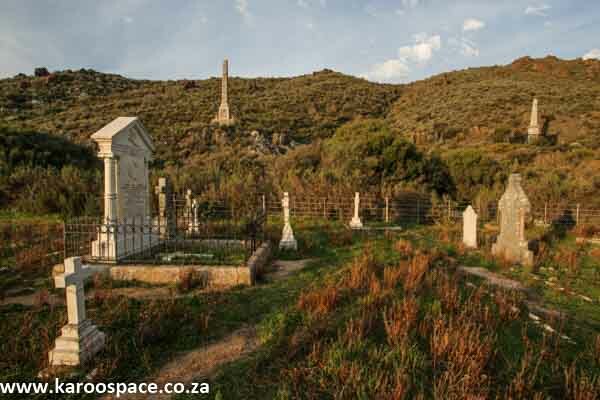 Back up the N9, over the Lootsberg Pass and into Middelburg, you will notice that their historical cemetery has been cleaned and restored. It is now a tourist attraction of note, and one of the characters buried there is John Sweet Distin of the nearby farm, Tafelberg Hall. John Sweet Distin had a love-at-first-sight feeling for South Africa. That’s why, sometime in 1846 while en route from New Zealand back to England, he jumped overboard in Table Bay and swam ashore to a new life. At the tender age of 20 John Sweet trekked up to the Eastern Cape Midlands, fought in the Frontier Wars, became a rich trader and farmer, made a killing during the ostrich boom, fathered 11 children, became a Member of Parliament for the Middelburg and Colesberg district and erected the first stock fence in South Africa. 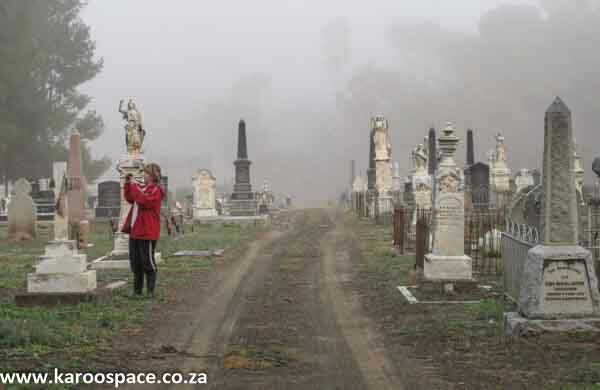 Wandering the Cradock Cemetery in the early morning mist. Take the N10 to Cradock, ask for directions to the main cemetery and you’ll soon find yourself fascinated by what one of our local chaps calls “The Valley of the Stiffs”. 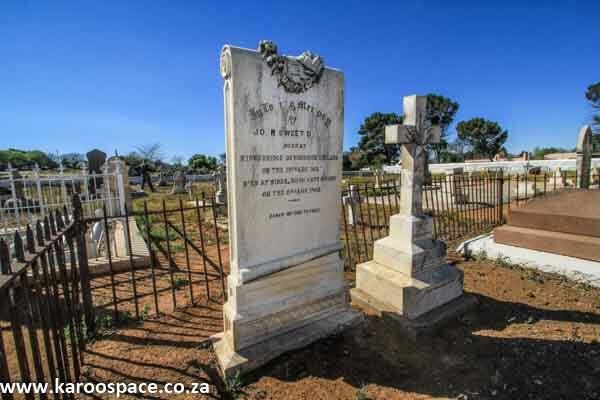 Should the dead souls of the Cradock Cemetery rise from their graves on a moonlit night and sit down together at a long table by the side of the Great Fish River, it would indeed be a famous feast. Hosting the ghostly dinner would be polar explorer Dr Reginald Koettlitz and his wife, Marie Louise. He died on January 10, 1916, and Mrs Koettlitz expired a scant two hours after him. To his right would be General Pieter Hendrik Kritzinger, a major Boer warrior who led his British pursuers a devil’s dance through the district. To his left would be Harry Edwin Wood, who died in 1946 and was the official Astronomer and Timekeeper and second director of the Union Observatory in Johannesburg. He discovered and named 12 comets and 3 minor planets, and had a comet named in his honour by a colleague, “1660 Wood”. For the rest of the company, more than 70 British soldiers, a gaggle of nuns, four Cape Rebels (graves washed away in the 1974 floods) and here’s one Harry Potter, far from home, buried on Karoo soil. Anglo-Boer War sadness outside Springfontein. 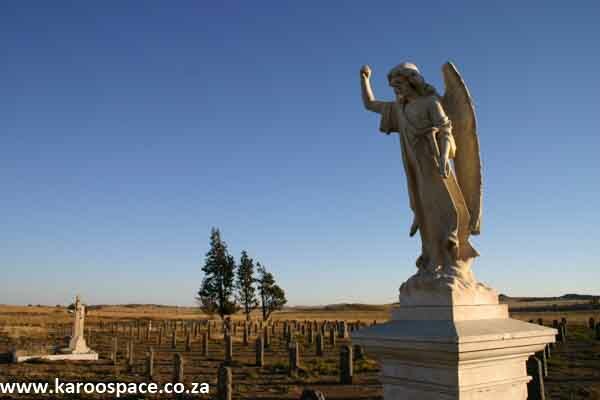 Two of the saddest cemeteries anywhere are in the Free State, at Springfontein and Bethulie, both the sites of Anglo-Boer War concentration camps. Their heartbreaking histories are recorded in many books, but when you visit these sites you will find few words to express the sorrow of those times. Very interesting. However, it is disgusting to see in what state some graveyards are, e.g. De Aar and Phillipstown. What can be done about it? What kind of people allow this to happen? We agree. But we’ve noticed that when tourists regularly visit graveyards and ask about graves at the local tourism office, they tend to get cleaned up and more care is taken. Often the tourism officials have no idea that cemeteries are of interest. So let them know! The more visitors there are, the fewer vandals, we’ve found. Willowmore also has a very pretty cemetery. Just be very sure to wear closed shoes. The ground is covered in devil thorns and can be damn painful if you get them in the soles of your feet.